Related Topics: How to Grow, Growing Organically & The Art of Propagation! Basil is a hardy, easy-to grow leafing herb. It is the Italian variety of the plant commonly known as Tulsi in India. 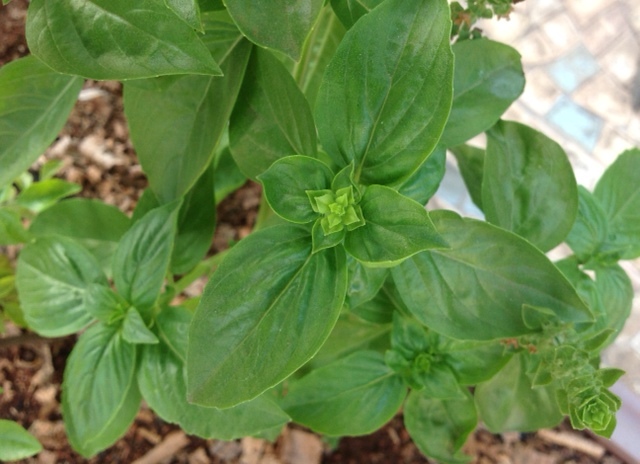 It has numerous variations including purple basil, lemon basil, Thai basil & strawberry basil. 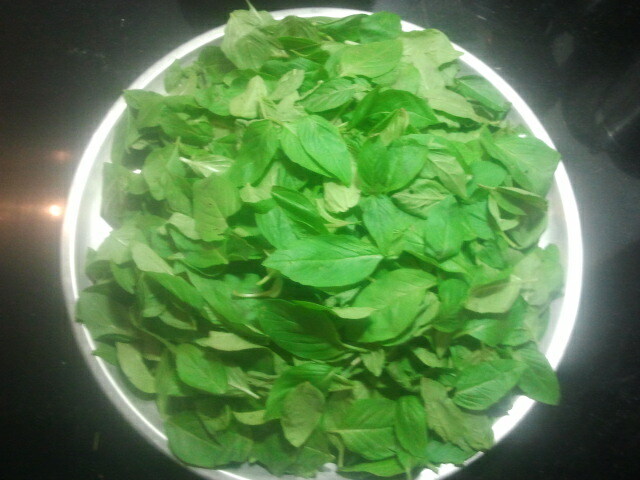 SEASONS: Basil is an annual. It is a hardy plant and can be sown and grown all year round. The monsoons are best suited for planting out seed or cuttings. PROPAGATING: This plant is propagated from seed or cuttings. It is easy to propagate through seeds, and even easier through cuttings. GERMINATING: Basil seeds are best germinated in germination dishes/seeding baskets prepared with a mixture of compost and peat moss. Seeds can be shown in shallow, 1/4 inch deep holes or scattered on the surface with a sprinkling of soil above. Place in semi-shade and spray water evenly. Spray your sown seeds daily until seedlings emerge in 5-7 days. PLANTING OUT: Transplant your basil saplings when they are 2 weeks old to very well-drained soil in a very sunny spot. The soil could be sandy and should not be too compost or manure rich. Rich soil tends to produce lots of foliage with low oil-content in its leaf. The soil should not be too acidic as basil prefers neutral and alkaline soils. Follow these tips to plant your basil cuttings – using obliquely-cut, un-refrigerated, hardy, green stalks that are trimmed off any leaf or flowerets. Your basil seeds/cuttings need to be spaced at least 12 inches apart to allow room for growth. It’s a good idea to plant basil alongside fruiting veggies like tomatoes, peppers, okra and brinjals, as their aromatic and antiseptic qualities deter pests that these plants are prone to. Basil will grow well on open plots or in containers. NURTURING: Shoots will emerge from your seeds/cuttings in 7-10 days. Basil is a quick and non-fussy grower that quite enjoys growing in Mumbai. It is never preyed on by squirrels, rodents, birds or other pests. It will take care of itself as long as you water and prune it regularly. Pruning is done from early growth – by pinching newly formed top buds to allow lateral stem formation, and until maturity – by snipping off stems that are likely to flower so that plant energy and sweetness is directed to the leaf instead of the flower. HARVESTING: Harvest tender, newer leaves/stems when the plant is in early and mid-growth. Once flowers are formed, the plant’s energy is re-directed away from its leaves which start to lose their sweetness. After a year’s harvest or when stems turn brown and reedy, let your plant finally flower and go to seed. 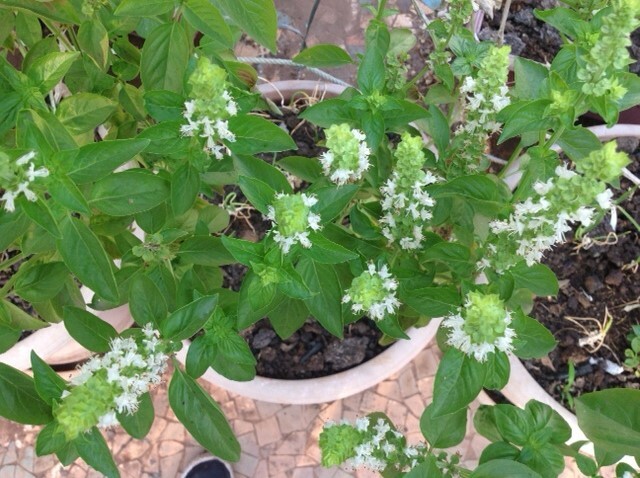 Basil flowers are bee magnets, and I have witnessed my basil crop keep a whole honeycomb of bees busy through summer! These bees will then bring good karma and pollination to the rest of your flowering veggies! Once your basil flowers dry up, you could thresh them for seeds, and dry thoroughly for storage and use. When your plant is spent after a year, uproot and compost it, replenish the earth and use that space for growing fruiting or rooting veggies. Basil leaves ready for harvest, and a basil plant left to flower for seed collection. Flowering basil is a great attraction for bees that thrive on its nectar. Can you give a source for basil seeds? Searched online, and in the stores at byculla, too expensive and very small packets. Any sources for a larger quantity, like in kgs, and cheap? Sorry, I have no idea where one can purchase basil seeds in Kgs. Perhaps you could join our Mumbai Farmers group on facebook and ask the question to the community. There are over 3000 members and someone else may know.